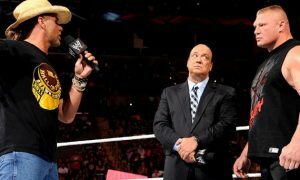 The Rock made some news last week in an interview with Peter Rosenberg of Hot 97 in New York City when he said that it was a “possibility” that his match against John Cena at WrestleMania 29 was his very last WWE match. To me I would be shocked if this is the last time The Rock wrestled for the WWE and in professional wrestling. While I believe that thought has crossed his mind and that movie executives may suggest for him to do that since he was injured in his last match against John Cena, I would be shocked if he never wrestles again. Lets be honest with ourselves, The Rock is a motion picture machine and in high demand right now in Hollywood. Movie executives are probably concerned that he would get back in the wrestling ring and put his movie career/schedule in jeopardy should he get injured again. The Rock needed to put word out there that he may have wrestled his last match so he didn’t lose any potential work coming up. Movie executives will look at what happened to The Rock and instead of offering or giving him a role they may turn to a different direction and put the future of his movie career in question. The Rock can’t have that happen and while I don’t think it would happen since he is so popular right now, he needed to cover all his bases. After 7 years away from the business where he tried to reinvent himself into a “serious” movie star, he returned to the company that gave him his first big break to “give back.” He gave back in a big way and there is no way you can deny that (stay tuned for next week). After everything I have seen in the last 2 years I believe that whether it is in the squared circle every WrestleMania or not, The Rock is back in professional wrestling to stay. Plus we know how those “retirement” things go in professional wrestling; you never, say never, just ask “Stone Cold” Steve Austin who can’t stay in retirement some 10 years later. If there is anything in question right now I would lean more towards his reported and confirmed (by The Rock himself) match with Brock Lesnar at WrestleMania 30. If The Rock getting hurt again in a wrestling match is or becomes a bigger deal then many of us even realize then he could very well hold off wrestling at the SuperDome next April. I would put those chances of that happening at 10% right now and would not be shocked if we get word The Rock is confirmed for a match at WrestleMania around the fall of this year just to be safe. The Rock is a smart business man and he knows it wouldn’t have been a good look had he gone out there the night after WrestleMania where he was injured. What he did was preventative maintenance by getting checked out, avoiding the in-ring confrontation against Brock Lesnar and putting a return to the ring in-question. Wrestling is in The Rock’s blood and it’ll be tough for him to go away. 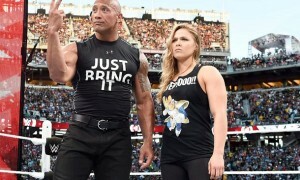 The Rock is NOT done with professional wrestling. 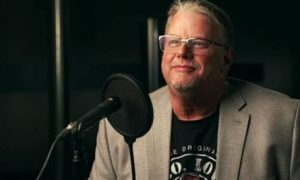 For more on this topic join us for the Thursday May 2nd edition of “The Still Real to Us Show” and download the show at www.wheelhouseradio.com or www.wrestlechat.net. 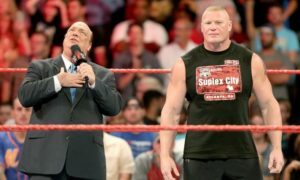 Brock Lesnar Leaves: Who is the Next Paul Heyman WWE Guy?